A Labour councillor suspended from the party over anti-Semitic comments on her Twitter account has resigned. 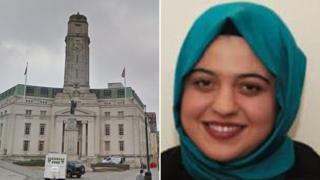 Luton councillor Aysegul Gurbuz said messages claiming Hitler was the "greatest man in history" made when she was "just 16 or 17" were "ill judged and offensive". She said "multiple people" had had access to her account. "I am horrified to read back what was written and I apologise for them in their entirety", she said. The tweets, which date back to 2011, were made before Ms Gurbuz, a student at University of Warwick, was elected to Luton Borough Council in May 2015, aged 20. Another tweet suggested Iran could develop a nuclear weapon to "wipe Israel off the map". In a statement she apologised for letting those who voted for her and the Labour party down. "Multiple people had access to my account and the tweets made do not reflect what I believe, but I take full responsibility for what was spoken in my name," she said. "I believe it is the right thing to acknowledge the pain I have caused and have resigned." The Labour Party confirmed on Sunday she had been suspended. Leader Jeremy Corbyn said anyone who makes anti-Semitic remarks is "auto-excluded from the party" pending an inquiry. A council spokesman said the matter would be "referred as a matter of urgency to the council's independent standards committee to allow a full investigation to take place."